Horizons-1 was successfully launched by the Sealaunch Company, LLC from its equatorial launch site at 154 degrees West longitude, which is about 2,240 km south of Hawaii, at 01:03 p.m. on 1st October 2003 (Japan Standard Time). The "Horizons-1" satellite is jointly owned by JSAT Corporation and PanAmSat Corporation, one of the world's leading satellite operators. This made JSAT one of the first satellite communications providers in Asia with a satellite over North America." 1. "Whale Ecology Observation Satellite (Kanta-kun) System"
This article on Whale Ecology Observation Satellite (WEOS) was written by Prof. T. Hayashi, Messrs. K. Yokoyama and S. Hosokawa of Chiba Institute of Technology, who have developed and are operating the WEOS system very successfully. "We launched Whale Ecology Observation Satellite (WEOS, Kanta-kun) on Dec. 14, 2002 by H2-A rocket of NASDA as one of the piggyback payloads into a polar orbit. Ecological data of whales are sent from probes attached to whales on the ocean to this satellite, which collects those data, stores in an onboard memory, and sends back at a command to a ground station." FedSat was launched as a "piggyback" payload by H-IIA Flight No. 4 from Tanegashima Space Centre on 14 December 2002, together with the Advanced Earth Observations Satel-lite ADEOS-II and the Japanese microsatellites WEOS and ƒÊ-LabSat. This was the first time that the H-IIA vehicle placed a non-Japanese satellite in orbit. Launch separation was verified, one orbit after launch, by telemetry from the on-board CCD camera. "Broadband Services through Satellites in Asia-Pacific" Mr. Yutaka Kazekami, Senior Editor, Space Japan Review, has organized this Plenary-C. Six prominent speakers from major Asian regional satellite operators presented their respective broadband service applications and strategies and introduced the current applications to audience. After presentations, all six speakers and Plenary Chair, Dr. Eui Koh participated panel discussion. It was held in the microwave exhibition from November 26 to 28, 2003 in Pacifico Yokohama. There is meaning, which shows how the exhibition parts combines in the system. Moreover, AIAA joined company seminar and introduced the exhibition items. AIAA Japan Forum of Satellite Communications and SAT(Satellite Telecommunications Technical group of the Institute of Electronics, Information and Communication Engineers (IEICE)) organized a two-day conference, Joint Conference on Satellite Communications (JC-SAT 2003), with KOSST (Korea Society of Space Technology) on October 23-24, 2003 at National Museum of Emerging Science and Innovation, Tokyo Japan. On November 2003, Space Communications Corporation (SCC. Headquarters: Shinagawa, Tokyo. President: Masuyuki Annen) and its subsidiary, Seiryo Communications Inc. (SRY. Headquarters: Shinagawa, Tokyo. President: Tsutomu Kizawa) has constructed the first system of re-mote-monitoring illegal dumping via a communication satellite for Gifu Prefecture. 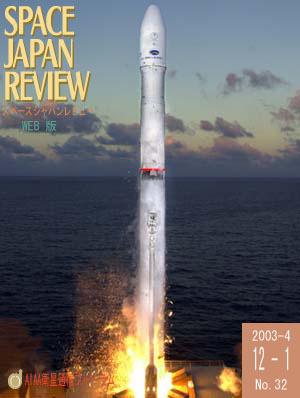 In this New Year's issue of Space Japan Review, it is carried editor's photo and New Year's greeting. And also, it is carried some papers of small satellite in the Special Report. In this new series "Letter from Washington", Professor N. Helm and Professor Joseph Pelton of George Washington University reports are contained.